I am thinking too of those who have resisted the countless graces and fruits of this place that often read like the Acts of the Apostles on steroids. It is not my place to declare Medjugorje true or false—something the Vatican continues to discern. But neither do I ignore this phenomenon, invoking that common objection that “It’s private revelation, so I don’t have to believe it”—as if what God has to say outside the Catechism or Bible is unimportant. What God has spoken through Jesus in Public Revelation is necessary for salvation; but what God has to say to us through prophetic revelation is necessary at times for our ongoing sanctification. And thus, I wish to blow the trumpet—at the risk of being called all the usual names of my detractors—at what seems utterly obvious: that Mary, Mother of Jesus, has been coming to this place for over thirty years in order to prepare us for Her Triumph—whose climax we seem to be rapidly approaching. And so, since I have so many new readers of late, I wish to republish the following with this caveat: though I have written relatively little about Medjugorje over the years, nothing gives me more joy… why is that? While I’ve shared my own experiences of Medjugorje in the past (see That Medjugorje) as well as a powerful encounter of Divine Mercy there (see Miracle of Mercy), today I am going to speak to those who want to see Medjugorje shut down and mothballed. But what is the purpose of this faith, brothers and sisters? What is the purpose of this Revelation handed on to us some 2000 years later? It is to make disciples of the nations. It is to save souls from eternal damnation. For eight years, I have had the often painful task of standing upon the rampart and watching the approaching Storm across a spiritual landscape that is mostly barren and parched. I have gaped into the mouth of evil and its machinations to the point where, only by God’s grace, have I not despaired. Upon this landscape, I have had the privilege of meeting little oases of grace—men and women who, despite the apostasy around them, have remained faithful in their lives, their marriages, their ministries, and apostolates. And yet, I hear Catholics repeat that, somehow, this Scripture does not apply to Medjugorje. And I am left with my mouth hanging open, silently asking the question: What are you thinking? As an evangelist in the Church for nearly 20 years now, I have prayed and begged the Lord to bring about conversion and repentance wherever He sends me. I have stood in nearly empty churches preaching the Gospel to parishes that are practically on life support. I have walked past their confessionals-turned-broom-closets and stood at the back as mostly white-haired congregations mumble their way through a Liturgy that is apparently no longer relevant to people my age. Indeed, I’m in my forties, and my generation has practically disappeared from nearly every one of the hundreds of parishes I have visited around the world. 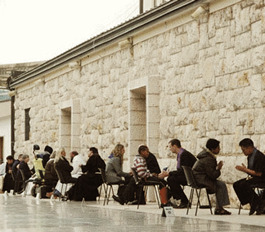 …And then I see in Medjugorje line-ups of young and old to the confessional. Over-crowded Masses that happen on the hour all day long. Pilgrims climbing mountains barefoot, ascending in tears, often descending in peace and joy. 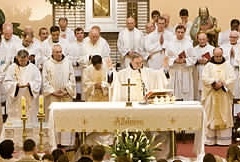 And I ask myself, “My God, isn’t this what we pray for, hope for, long for in our own parishes?” We are living at a time when heresy has nearly decimated the Church in the West, when errant theology and secularism in many places continues to spread like cancer, and compromise (in the name of “tolerance”) has been held up as a cardinal virtue… And then I listen to people actively campaigning against Medjugorje, and I ask myself again: What are they thinking? 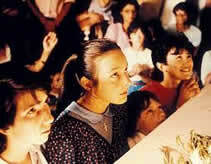 What exactly are they looking for if not the very fruits of Medjugorje? “It’s a deception,” they say. Well, sure, we have to wait and see what Rome has to say about it (though after 33 years, it’s clear that the Vatican has been in no hurry). But if it is a deception, all I can say is that I hope the devil comes and starts it in my parish! Let Rome take its time. Let the “deception” continue to spread. I’m thinking right now of a friend, the powerful missionary Fr. Don Calloway. As a youth, he fried his brain on drugs. He was led out of Japan literally in chains. He had zero understanding of Catholicism. Then one night, he picked up a book of the messages of Medjugorje. As he read them, something began to change him. He sensed Our Lady’s presence, was physically healed (and physically transformed) and infused with an understanding of Catholic truths at the first Mass he attended. Now, I mention this because I’ve heard the argument that, if Medjugorje is a deception—that if the Vatican rules against it—millions will be dragged into apostasy. 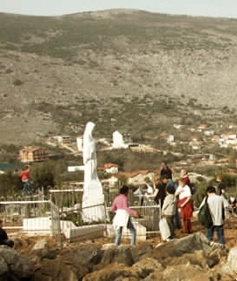 The most noticeable, most impressive fruit of Medjugorje is how souls have returned to love and grow in faithfulness to their Catholic heritage, including a renewed obedience to the Holy Father. 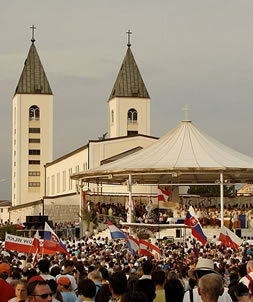 Medjugorje, is in fact, an antidote to apostasy. As Fr. Don said, what happened to him happened—but he will adhere to whatever the Vatican decides. There will always be those, of course, who will rebel against the Vatican in such a case. 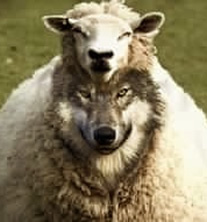 There might be the few who “leave the Church”, right alongside the “traditionalists” and others who have sometimes lacked the humility and trust to stand by the sometimes difficult decisions of the hierarchy that, nonetheless, need to be heeded. In those cases where people genuinely apostasize, however, I would not blame the Church nor Medjugorje, but the formation of that person. “But it’s a circus there,” some object, “all those little shops, restaurants, new hotels, etc.” Have you ever been to the Vatican lately? You cannot get to St. Peter’s Square without passing by strings of souvenir shops, beggars, rip-off artists, and cart after cart of meaningless “holy” trinkets. If that is our standard for judging the authenticity of a site, then St. Peter’s really is the seat of Antichrist. But of course, the reasonable response is to recognize that, wherever large crowds gather frequently, services are needed, and pilgrims themselves are the ones who fuel the souvenir business. Such is the case at Fatima and Lourdes as well. As I mentioned recently in The Great Confusion, the central message of Medjugorje has been consisently in harmony with Church teaching. cf. cf. the five points at the end The Triumph – Part III; cf. Five Smooth Stones And the alleged seers have obediently and consistently preached it: Prayer, Scripture, Confession, Fasting, and the Eucharist are the reoccurring themes that are not only spoken, but witnessed there. But there is another message that has come out of Medjugorje, and it is indeed false. It’s time this story was told. In my travels, I met a renowned journalist (who asked to remain anonymous) who shared with me his first-hand knowledge of events that unfolded in the mid-1990s. An American multi-millionaire from California, whom he personally knew, began a tenacious campaign to discredit Medjugorje and other alleged Marian apparitions because his wife, who was devoted to such, had left him (for mental abuse). He vowed to destroy Medjugorje if she didn’t come back, even though he’d been there numerous times and believed it. He spent millions doing just that—hiring camera crews from England to make documentaries defaming Medjugorje, sending tens of thousands of letters (to places like The Wanderer), even barging into Cardinal Ratzinger’s office! He spread all kinds of trash—stuff you now hear rehashed and rehashed again… stuff that apparently influenced the Bishop of Mostar as well (in whose diocese is Medjugorje). The millionaire caused quite a bit of damage before finally running out of money and finding himself on the wrong side of the law… Bottom line, the journalist recounted, this man, who was possibly mentally ill or even possessed, did a remarkable job influencing others against Medjugorje. He loosely estimated that 90% of the anti-Medjugorje material out there came as a result of this disturbed soul. 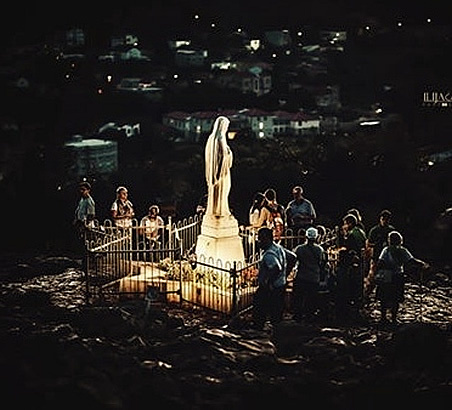 If in fact Medjugorje is an authentic apparition site, I do not believe it will be long before the Hour of Medjugorje is upon us—when the alleged secrets that the seers have kept silent all these years are revealed to the world. Many cannot believe that Our Lady would continue to give monthly messages to the world there… but when I look at the world, I cannot believe that she wouldn’t. 5. ↑ “Mic’d Up” with Michael Voris and E. Michael Jones. See Daniel O’Connors assessment here: dsdoconnor.com Note: Often, vocal critics have never been to Medjugorje, yet make pretty damning pronouncements.